Enter a world of contemporary elegance with the wall hung Euro Collection. 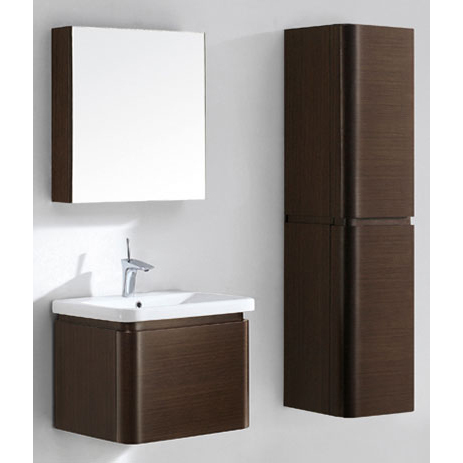 The curved, organic vanity design will seem to float on your wall, a stunning example of quality, form and function. Featuring a pristine, polyurethane-protected finish in Glossy White or Walnut solid wood veneer, spacious interior drawers with European Grasshopper® metal & glass railings—and even a magazine rack—you'll find no detail overlooked. To complete the collection, the matching linen cabinet is as stunning as it is functional with a full16'' depth and two easy-access doors with built-in glass shelves and retaining glass rails.